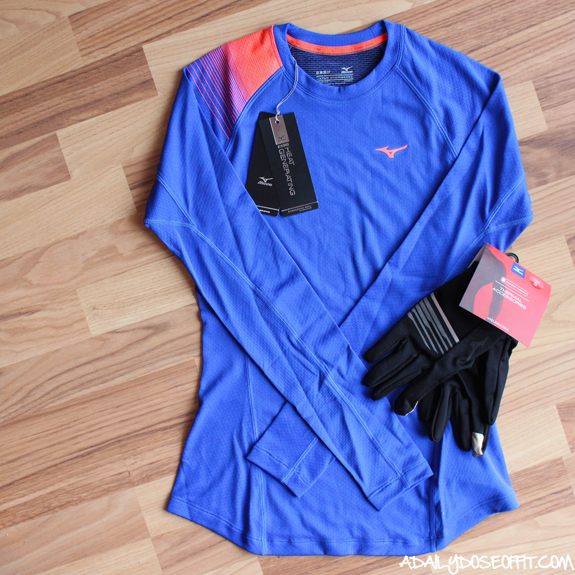 The following post is sponsored by Mizuno via my partnership with FitFluential, LLC. All opinions are, as per the usual, my very own. Ask my running buddy how much I love running in the heat of Summer, and he'll tell you that I have one thought for him: "Just wait until I make you run with me in the Winter." 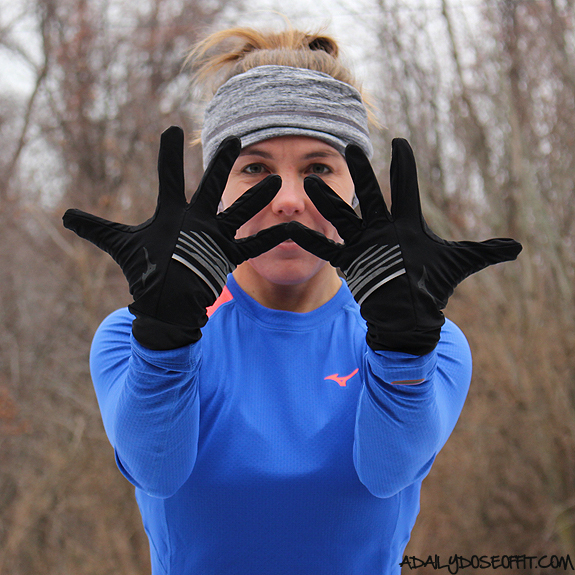 See, Winter running is my jam. Cold weather provides crisp air which makes the miles feel so refreshing. But I get it, Winter running can be awful. It's cold when the snow falls! But if you're prepared for it with awesome cold weather running gear, Winter running can be enjoyable. 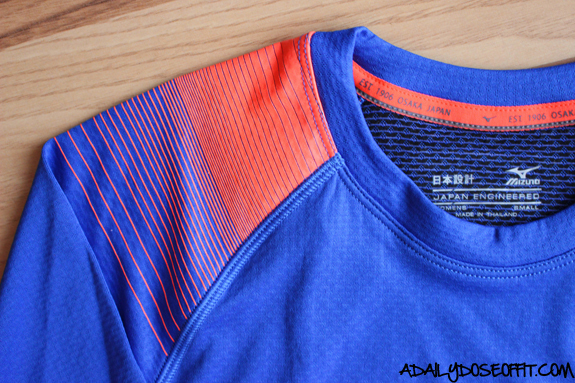 It really does make a great base layer. I think the only thing I don't like about the shirt is the lack of thumb holes. Life is best lived in shirts with thumb holes, amiright? I'm wearing a small and found them to fit pretty snugly. In fact, they weren't easy to get on and off, which I actually didn't mind. One thing I didn't like: The touch screen forefinger. It wasn't working very well on my Apple Watch and iPhone. Could just be me, though. Who knows. So...in addition to the headband, long pants and light jacket, this Mizuno gear kept me comfortable on a 30ish-degree day. Toward the end of my run, I pulled the gloves off and felt like I could ditch my jacket, but ultimately kept both on and made it home safely. Today's lesson: Don't let Old Man Winter deter you from running outside in cold weather. Just get the right gear, layer up and pound pavement (just watch out for any ice, hidden or otherwise visible). 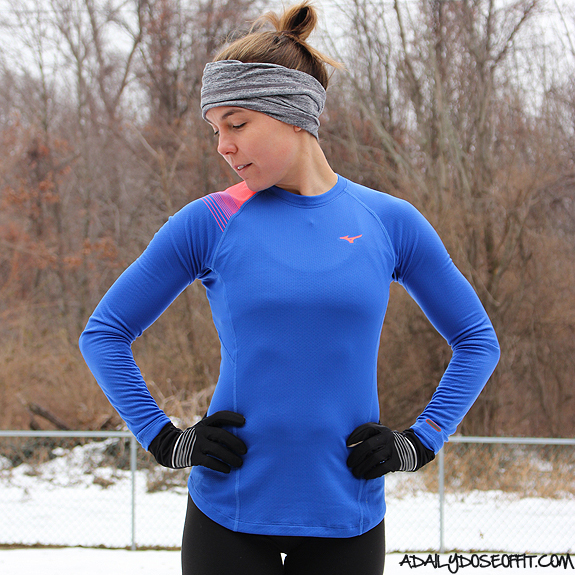 Question: Winter running or Summer running? Which one and why? December is a fun month. In addition to all of the wonderful celebrations, December carries with it the promise of yet another great year. January is coming, friends. Are you pondering your 2017 fitness, health and happiness goals? I am, too. 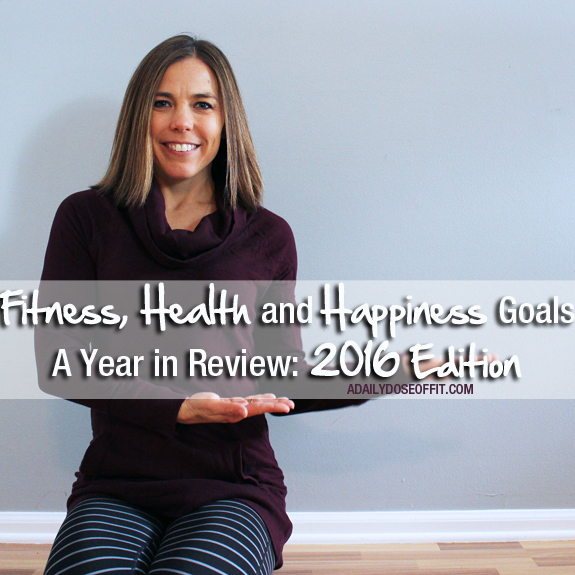 And since I'm not quite ready to set them in stone just yet, I thought it would be fun to look back on my 2016 fitness, health and happiness goals. Success. I've been regularly attending the Tuesday morning Power Yoga class at my gym. I've noticed a huge difference both physically and mentally. I've also been playing a lot outside of class. 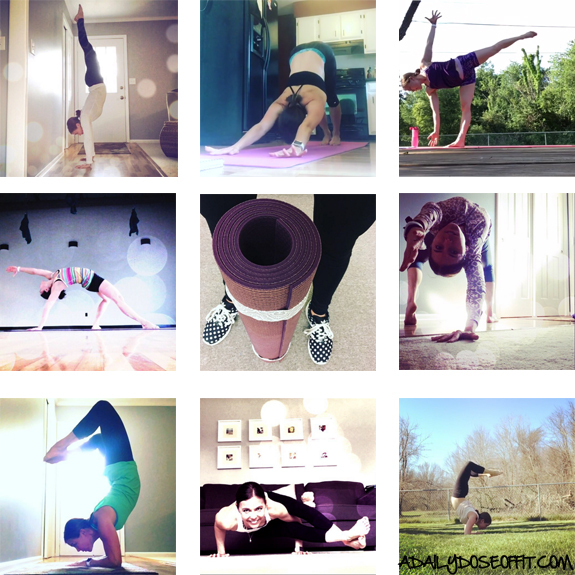 Clearly I'm in love with arm balance poses. 2) Run the Fifth Third Riverbank Run 25K. Major failure. I definitely did not do this. It remains on the bucket list. 3) Get my ACE Group Fitness certification. Success. Finally. I spent the entire first half of the year studying for the exam, and the back half of the year praising God that it was over with. It wasn't hard, per se. But I spent a lot of my free time studying for it. I highly recommend the ACE Group Fitness certification. 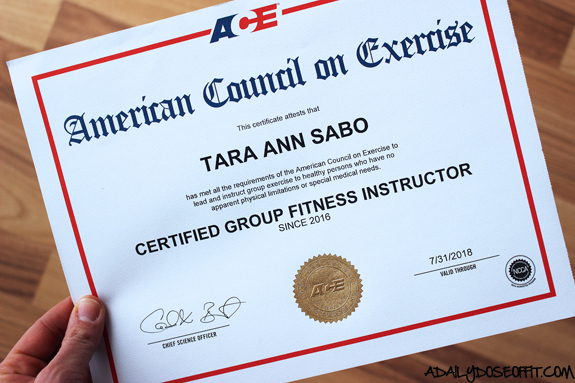 The American Council on Exercise is a great organization that's easy to work with. 1) Get back to prepping meals and snacks. Success. Not every week is perfectly planned out and/or prepped to perfection, but I'm certainly putting forth the effort. When I build my grocery list, I always try to have at least one make-ahead meal or snack on the list. Sometimes more. 2) Get my eyes checked. Another major failure. Unless you count the eye test you take when you renew your driver's license. It's been so long! Yikes. Success. 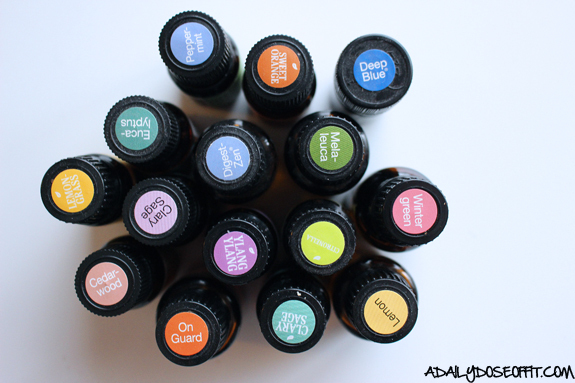 This girl is hooked on learning about oils. 1) Return to my faith. 2) Take time to relax—with and without my children. I am constantly addressing my need to slow down. Case and point: Shutting down the blog for a few months. The whole "relax" thing will always be a struggle for me because there will always be a list of things that need to get done or people that need my attention, but I'm learning to recognize my own personal need for space and time in which to breathe. It's important, that whole self care thing. And I need to do more of it. 3) Spend less money on things so I can spend more money on experiences. Question: How did you do on your goals this year? Is there anything on your list that didn't happen? How about an accomplishment you're really proud of? If you sign up for sessions with a personal trainer, you will get targeted attention that will help you reach your health and fitness goals—but what if personal training sessions don't interest you? Or maybe it's not in your budget. The answer: Group fitness. Join any gym and you will gain access to a list of classes, one of which is bound to meet your needs. And, yes—you can (and should) take the class. "What if I can't keep up?" "I've never done it before." "I don't know anyone else." "It won't be a good workout." The list goes on, and many these reasons are quickly debunked the moment you take that first step into the fitness studio. Group fitness processionals are trained to make you feel at ease as they challenge you to step outside of your comfort zone. I'm sure yo've heard: That's where all the magic happens. 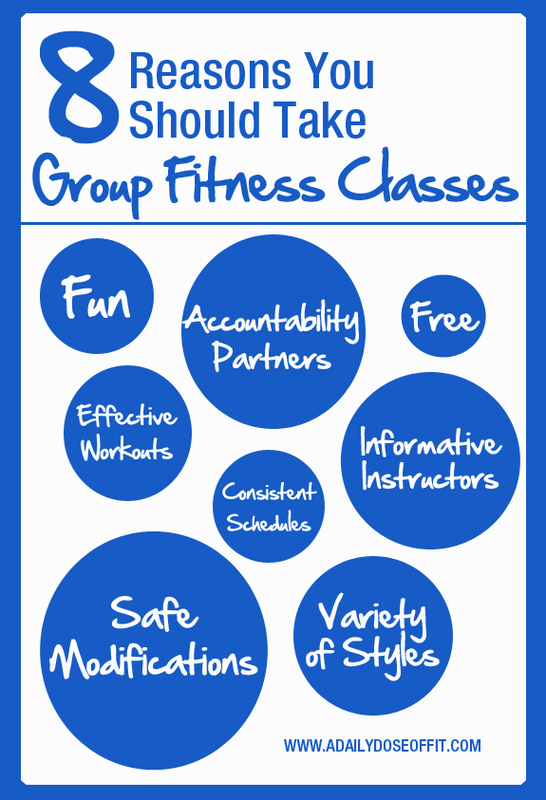 There are a variety of reasons why you should be attending group fitness classes. Today, let's talk about eight of them. 1) Go and keep going and you'll have a room full of accountability partners. You will make friends and they will help you stay motivated to reach your health and fitness goals. 2) Group fitness is fun, it really is. 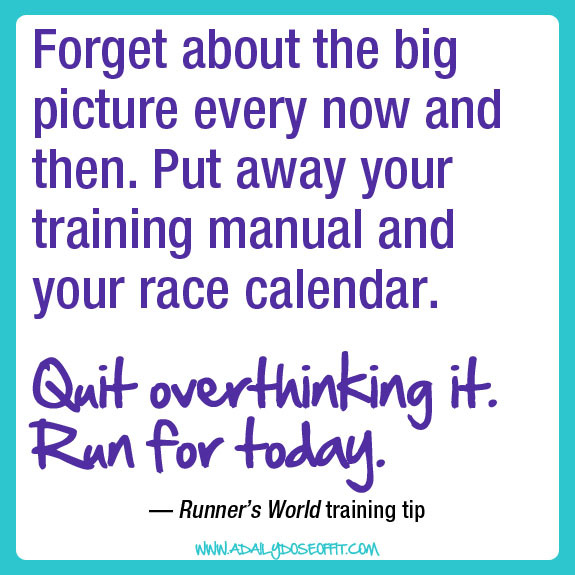 3) You don't have to worry about coming up with a workout that is effective. The instructor will provide effective workouts for you, every class...every time. 4) Every group fitness class can be modified, which is totally acceptable. Safe modifications are key, and also a way for you to monitor your progress. Eventually, you won't need them! 5) Most of the time, group fitness classes are free with your gym membership. If and when they aren't, there is probably a good reason why. All things considered, the price of attendance will be less than personal training sessions—and certainly less than a medical bill. 6) Informative instructors can educate you about health and fitness, and are always ready and willing to provide answers to your questions. If they can't, they will almost always point you to someone who can. 7) Consistent schedules help you keep your fitness routine consistent from week to week. 8) In terms of interest, there is literally something for everyone! Find what fits your interests and embrace every aspect of the challenge. Don't know what class is right for you? Ask the staff! They can describe the variety of styles available to you. Question: What is your favorite group fitness class? What's your take on group fitness in general? If you don't take group fitness classes, why not? Winters in Michigan are always fun. I live on the shores of Lake Michigan, which makes for some very interesting snowstorms. 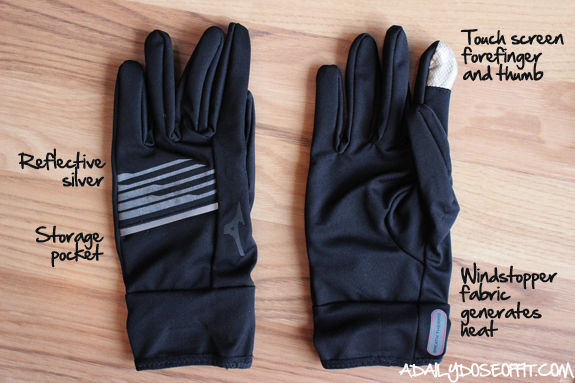 This, of course, changes the way I approach running in the Winter. Despite having access to a track and treadmills at the gym, I still prefer to run outside. Even when it's cold. But again, up here in Michigan, when it's cold...oh, baby it's cold outside. 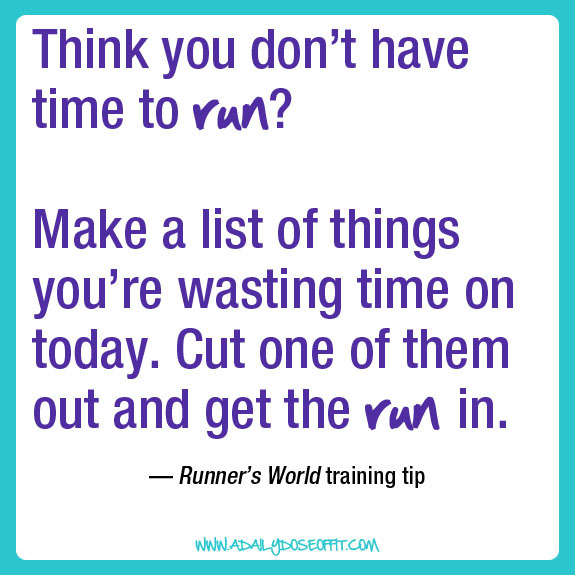 So I need all the running motivation I can get at this time of year. 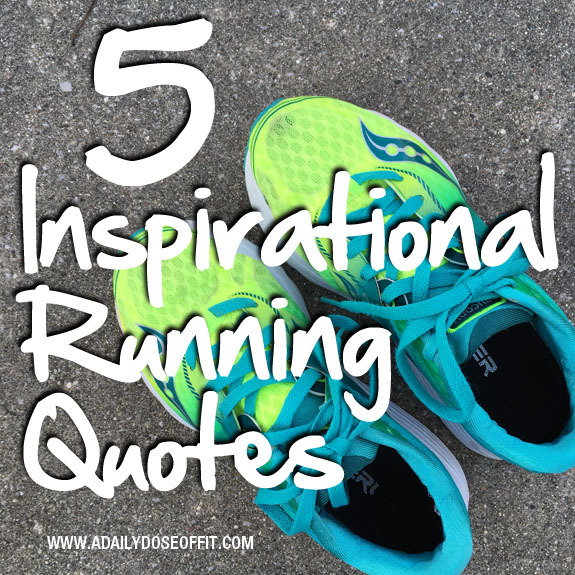 So today, I thought it would be fun to share five inspirational running quotes. Might not get so lucky this weekend. Time will tell. Back to the quotes. 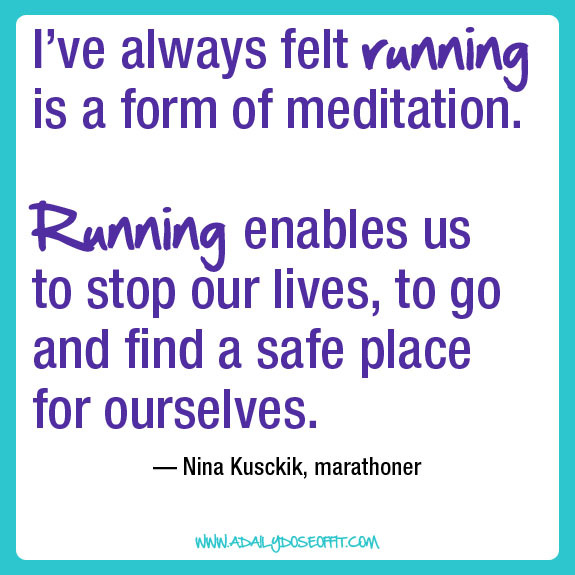 Although they aren't specific to Winter running, I find them extremely motivations and uplifting. And as I've said before, I need all the motivation I can get at this time of year. Maybe you'll find them useful, too. 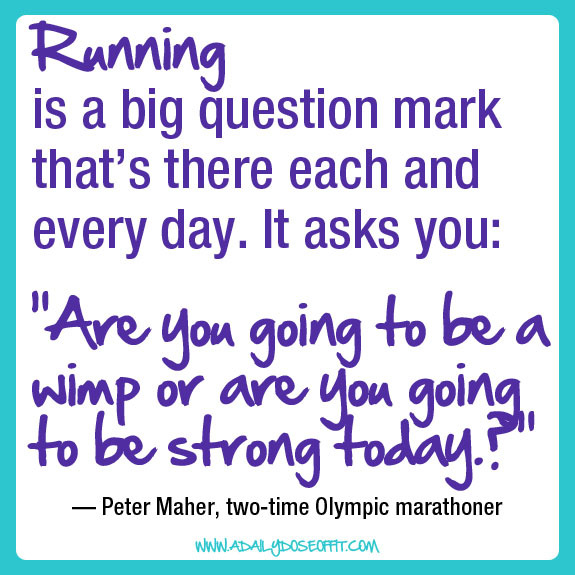 Question: What's your take on Winter running? 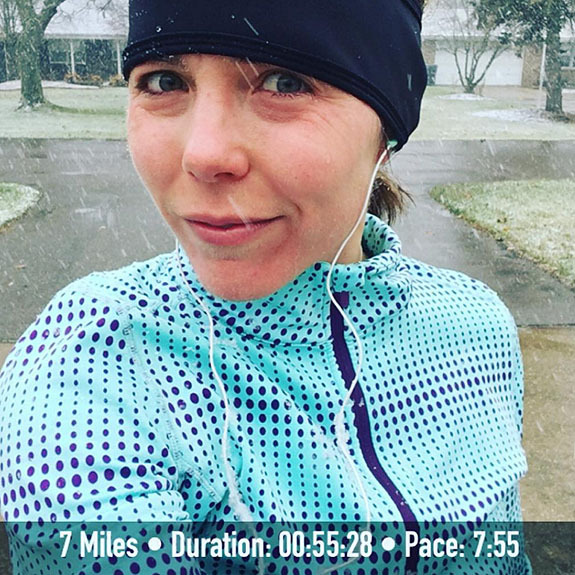 How do you stay motivated at this crazy time of year? 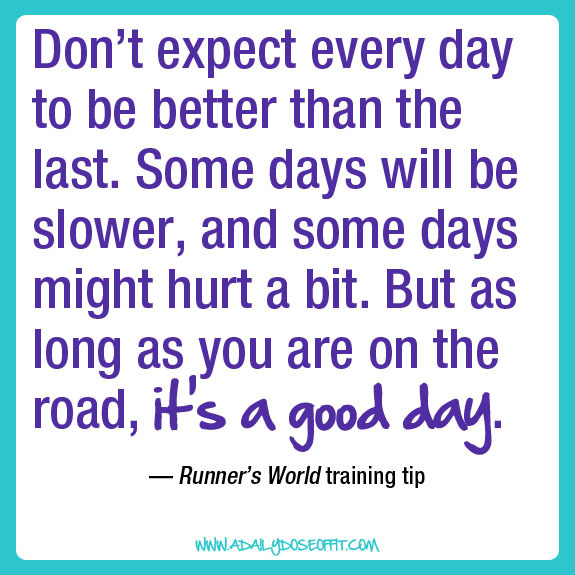 Is there a quote that keeps you going?